So, last time, I covered a few of fantasy's long-lasting conventions: and how they can and could still be done well - we included troubled pasts, possession, and pretty glowy magic. This time, I've got a few more to talk about: and as always, if you've any suggestions, just comment below! ...Because there are definitely some where resurrection doesn't work. Every second fantasy out there claims its events usher in a 'new era' for its world: and normally it's just a marketing spiel. Nothing really changes - except the protagonists are frequently in charge. Mark Charan Newton's Legends of the Red Sun buck the trend excellently: the Jamur Empire is in a period of more than political change. Newton's fantasy is transformative - the Empire is facing an encroaching ice age which brings refugees from the islands to the cities, forcing social charge amidst the threat of starvation. The politics become about more than leadership - the burden of the incoming peoples, as well as a recently-appeared gateway to another world, make the Empire's choices far harder: and much more interesting for it! Newton handles the situation adeptly, especially amongst the siege of City of Ruin: mingling Mieville-esque racial and social tensions and the struggle for survival in what could quite readily be called a masterpiece of a novel. My review of City of Ruin is upcoming (it lived up to the promises, though!) 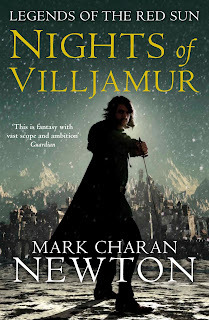 and you can find my review of Nights of Villjamur here. As suggested by the comment of Lightning Tree Live (which you can find on my blogroll - check it out, there are some truly excellent reviews). Well, this is possibly the convention of an awful lot of fantasy: for some reason, the protagonist is estranged from his or her family. Maybe their village was destroyed by goons. (The titular ashes). You've heard this before from me, but here it comes again: it can be done well. And my choice for this is the protagonist of Guy Gavriel Kay's excellent A Song for Arbonne, Blaise de Garsenc. His isolation from his Gorhautian family (and the rest of the nation, in fact) is a political matter - his father negotiated the truce which sold Gorhaut's contested northlands. And this, rather than providing the often-done motive of vengeance, provides much of the book's drive, which mingles the political and personal: Gorhaut is preparing to invade Arbonne on a religious crusade, and Blaise de Garsenc is at the heart of it. This motivational mixture also ties into the novel's themes of necessity, desire, and restriction. In short, it actually works - rather than as an excuse for angst. Any suggestions of your own? Comments or opinions? also, good reminder that i have to check out the Legend of the red sun books! Newton's series is definitely on my list of books to read. It sounds fantastic. I've actually never read anything by Kay before but I just got Under Heaven out of the library and I look forward to starting on it soon. @Yona: Thank you! Ooh, Deadhouse Gates is definitely one of my personal favourites of the series, though I won't spoil it for you - I'll be interested to know your thoughts. Legend of the Red Sun is definitely a worthy read, though the second book is -much- better than the first. @Simcha: Under Heaven isn't my favourite of Kay's novels, but it's definitely a great starting point, and takes up a relative uncommon setting, which is always good to see. I'll look forward to reading your review and seeing if you think the same way. Good post - and thanks for the shout! Shamefully, I've not read any of these authors yet, but my To Read list just got longer! On the Kay front, I'm thinking I'll start with 'Tigana', which I've seen recommended to fans of Robin Hobb. Hmmm, how about 'kidnap' for a convention? I.e. when a kidnapping triggers the adventure/quest...? Thank you! Hm, yes, Tigana would probably be my personal recommendation too: fantastically written as always, but both sides of the novel's conflict are somewhat grey by the end, which I find much more interesting!